Almost every time I talk to moms about financial abuse one of the questions that show up is “how could financial abuse impact my life long term?”. One interesting way I use to explain this topic is by identifying the unseen scars of domestic financial abuse, based on the form of abuse the abuser applies. I understand this question continues to arise because domestic financial abuse is a powerful weapon and, at the same time, very misunderstood by society, very unreported and with low media exposure. As one of the different forms of domestic abuse in which there are no physical scars or visible marks, it makes it more difficult for both the victims and their relatives to identify the abuse. This may be the reason why only 13% of Americans believe that this form of abuse can happen to people they know. 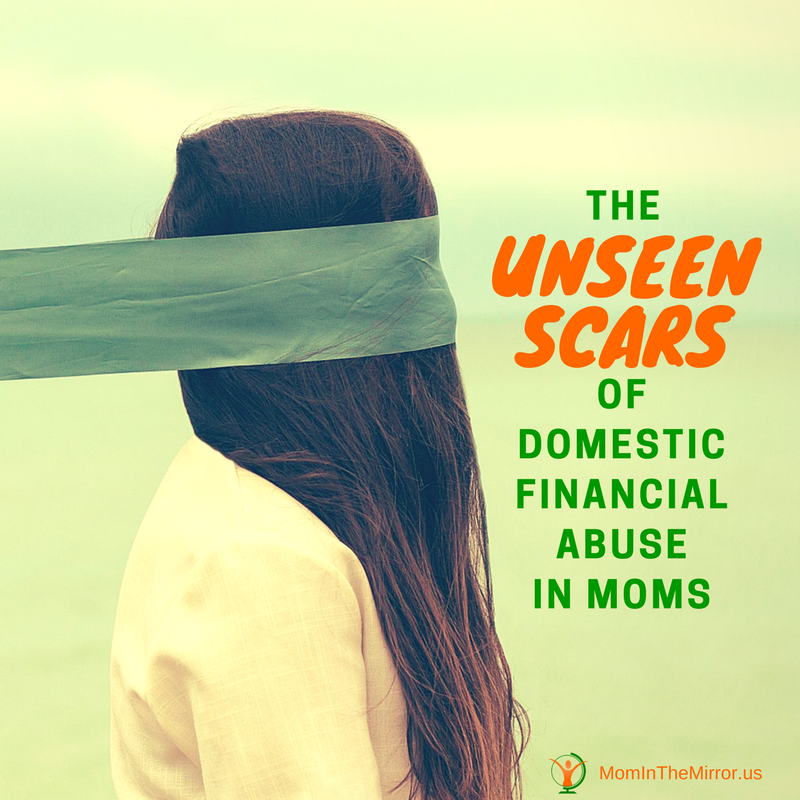 When I realized that Americans see financial abuse as the least common form of domestic abuse and also the least likely to cause lasting negative effects for the survivor, it was easy to understand why there are many unseen scars of financial abuse. This misinformation may be justified by the fact that more than 40% stated that they do not understand what financial abuse is about—according to the Allstate Foundation survey of 2014. As you will see in the list below, domestic financial abuse has a huge impact in the victims´ lives and the consequences, the unseen scars of domestic financial abuse, can manifest over a long period of time, even after the victim has left the abusive relationship. Poverty. Since domestic financial abuse is about money and financial resources, one of the main effects it pursues is to leave the victim without the strength that is derived from having money. He will steal, loss or break any assets and financial resources you may have, leaving you in poverty, completely out of money. He will guide you step by step in order you have to ask him for an allowance, and a justification for the funds requested, and he will make you accountable for any penny spent. Your sense of financial self-sufficiency will disappear and you´ll feel like trapped with no obvious way to go out because you feel that you lack the financial resources to support yourself and your children. Health problems. As a consequence of the lack of economic resources, food supplies and medicines necessary for the proper development of both the mother and the children, domestic financial abuse can cause malnutrition and other health problems, and the effects may persist until long after the victim has come out of the abusive relationship. My aunt was in a financially abusive relationship and I recall how her body was getting thinner and thinner along a few months. Her big eyes, once full of energy and vivid, now seem not to belong to the face on which they lay, showing a pale yellow color, just like if they don´t want to continue to be open. All her body alerted me that something was not quite right her life, but by that time, I was too young to understand what was happening. Depression and anxiety. This is one often misunderstood, unexpected and unseen scar. Many victims go into the denial of depression and anxiety based on their optimistic and upbeat style. However, according to Postmus et al. (2012) “moms who experience financial abuse are 1.9 times more likely to experience depression than those who have not, and this form of financial abuse is more predictive of depression over time than physical and psychological abuse”. 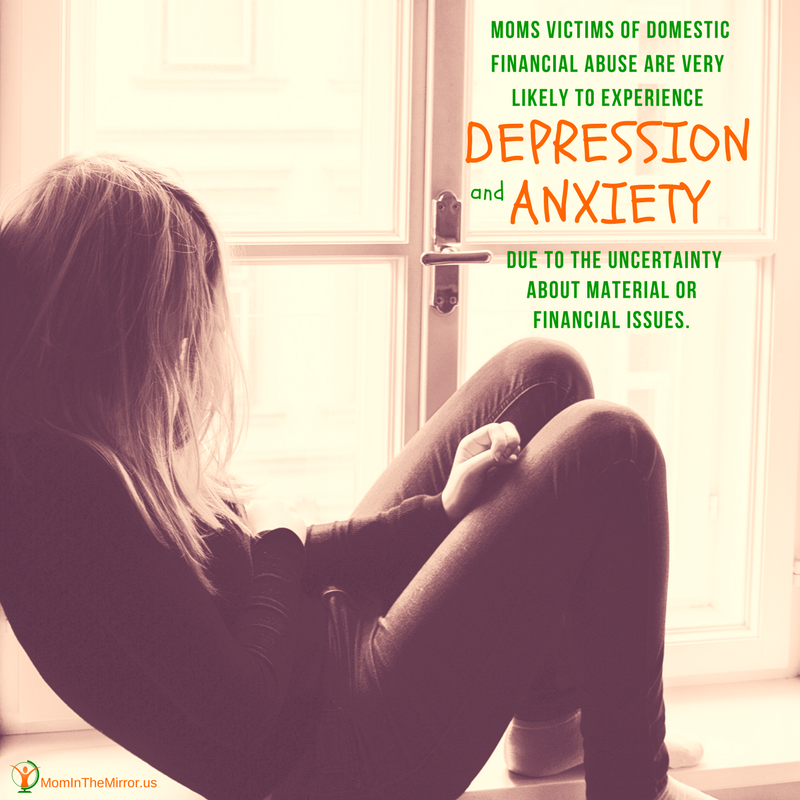 Moms victims of domestic financial abuse are very likely to experience depression and anxiety due to the uncertainty about material or financial issues. Educational stagnation. Since abusers know a higher education level will lead to a higher income and often more financial self-sufficiency, they won´t let you go back to study or attend any educational institution if you are trying to. On the other hand, if you are studying, they may break your books and other materials, hide your assignments, prevent you from attending a test, or forbid you to study, keeping you in educational stagnation. Sabotage of the victim’s work. This is one of the tactics of domestic financial abuse. The continuous visits, calls and text messages sent by the abuser during working hours, unjustified absences at work (often caused by another form of physical abuse), delays, among others, can cause the victim to be fired, leading that to job instability and making more difficult to return to the work market, due to her bad employment record. Ruined financial credibility. By overusing your credit cards, filing financial contracts (lease, loans, credit cards, utilities, etc.) on your behalf (when he previously manipulated you to fill out a power of attorney), refusing to pay bills, and forcing you to false legal financial document such as tax claims, he´ll ruin your possibilities to have a healthy financial life, causing debt and a bad credit score. The negative impact of ruining your financial credibility will last not only while you are in the relationship, but in the long-term after you leave. Without financial credibility moms who are victims of domestic financial abuse are less likely to have a place where to move with your children, are less likely to get public assistance, and can´t get a loan or any other finances resources. Negative parenting. Financial abuse impacts in parenting negatively. Moms who experience this form of abuse are more likely to spank their children and are less likely to engage in parent-child activities. According to Postmus et al. (2012) witnessing abuse is associated with problems among children including difficulties with temperament, social competence, and internalizing behaviors, and aggression. Lack of self-confidence. Once you are in poverty, full of bad debt, with a terrible credit score and bad employment record, you´re probably thinking your chances to overcome this situation are none. You become hopeless, weak, devastated, feeling unworthy and you may stop fighting your abuser since you could think there is no way to go out. Going through each one of this short and long-lasting effects of domestic financial abuse, one thing remains clear to me: there is no positive consequence in any form of domestic abuse, even when the scars are physically invisible. However, financial abuse can be more devastating for a mom in the long term since it takes away any bit of financial self-sufficiency you may have, even the ability to recover your self-worth, housing and be able to raise your children in a safe environment. If you think you are a victim of domestic financial abuse, I assure you that no matter how difficult it may seem now, there is always a way to get out of the trap, and there are many people seeking for ways to help you. If you know someone who is or has been a victim of financial abuse, I invite you to share in the comments below what is the one scar you think is more difficult to overcome.